A contemporary style, with a retro feel – Jonah's a popular collection, and now we're expanding it outdoors. 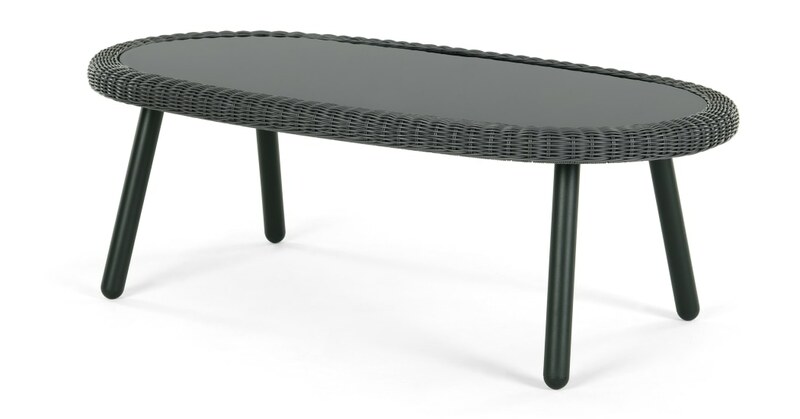 The curved edges, rounded legs and earthy grey poly rattan are a bold look for any space. The clear glass is edged by grey poly rattan and supported by black powder-coated metal legs – it'll work with any existing colour palette. With a wide rounded top, there's space for four to pull up a matching chair. Poly rattan and glass are durable and weather resistant. Just wipe them down after bad weather and they'll be ready to enjoy when the sun shines again.